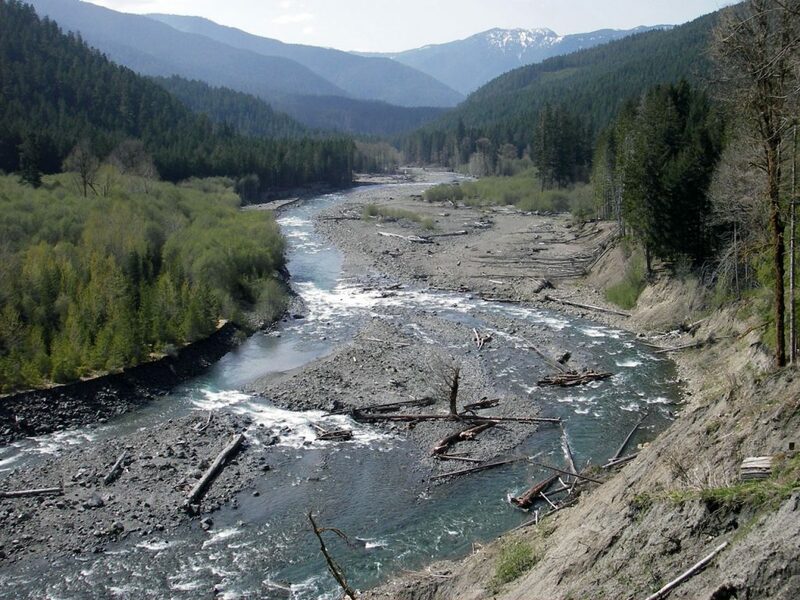 It has always been a question to ponder: Will the most significant changes to the Elwha River ecosystem occur upstream of where two dams have been removed or downstream where the river enters the Strait of Juan de Fuca? Soon after each dam was torn down in succession — the lower one first — salmon began migrating upstream, while more than 30 million cubic yards of sediment began moving downstream. It could take a number of years to rebuild the extensive runs of salmon, including the prized chinook for which the Elwha was famous among salmon fishermen across the country. Will we ever see the legendary 100-pound chinook return to the Elwha, assuming they ever existed? That was a question I explored in a story for the Kitsap Sun in September 2010. On the other hand, massive amounts of sediment have already spilled out of the Elwha River, building an extensive delta of sand and gravel, including about 80 acres of new habitat and two miles of sandy beach. Reporter Tristan Baurick focused on the dramatic shoreline changes already taking place at the mouth of the Elwha in a well-written story published in Sunday’s Kitsap Sun. The Coastal Watershed Institute, which is monitoring the shoreline near the mouth of the Elwha has documented increases in critical forage fish populations, including surf smelt, sand lance, eulachon (candlefish) and longfin smelt. See CWI Blog. These fish feed a host of larger fish, birds and marine mammals. Tristan describes the changes offshore, where an area starved of sediment is turning into prime habitat for starry flounder, Dungeness crab and many other animals. Rocky outcroppings that once provided attachment for bull kelp is giving way to fine sand, which allows for colonization by eelgrass and a host of connected species. I described some of the early changes in the flora in a Kitsap Sun story in March of 2013. For people to view the restoration first-hand, I described a day trip to the Elwha in a Kitsap Sun story in April of 2013. Along the way, you can check out the history, enjoy the vantage points and learn about the changes taking place. Tristan offers a suggestion worth heeding to ensure ongoing beach access. If you’d like to see a video record of dam removal and ecosystem recovery, you may wish to view the film “Return of the River” to be shown at Bremerton’s Admiral Theatre on Friday, March 13. The film will be followed by a panel discussion involving the film’s producers, John Gussman and Jessica Plumb. For details, check the Kitsap Sun website. Earthquake: What will it take to get ready, and why should I prepare? Store plenty of water. That’s my first bit of advice for earthquake preparedness. I suggest storing water for drinking — enough to last a week — and maybe some extra water for washing and cleaning. If we’re going to prepare for an earthquake, let’s prepare for a big one. Then we’ll be ready for smaller ones or even severe storms with the potential to isolate us. Getting ready for an emergency can help reduce the anxiety of thinking about a long power outage, broken water pipes and other damage. Do what you can, then realize that recovery will come, though it could take time. 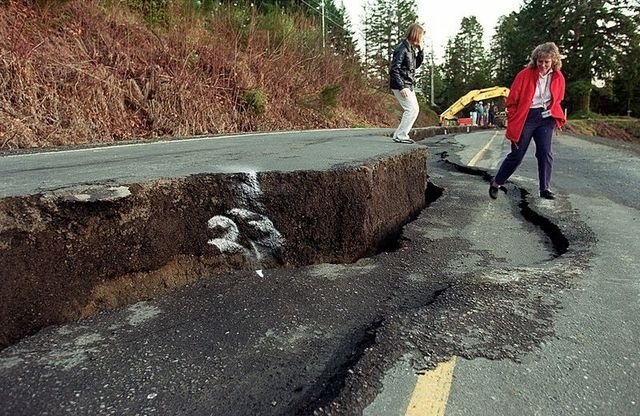 The 6.8-magnitude Nisqually quake, centered near Olympia in 2001, caused extensive damage to Highway 302 on the Kitsap Peninsula. But that quake could be considered small compared to what might result from a quake on the shallow Seattle fault. If you would rather ignore the dangers, I guess that’s one option for dealing with this kind of anxiety. But it could be a costly approach, one ultimately filled with regret. It may seem like a random number — 7.2 magnitude, large for any earthquake — but people need to understand that this earthquake would occur at or near ground level on a fault that runs through the center of Kitsap and King counties. That’s essentially right next door to hundreds of thousands of people. Such an earthquake is not imaginary. It has happened before — long before any cities were built. Where the fault broke free, the land and seabed were raised upwards by more than 20 feet. 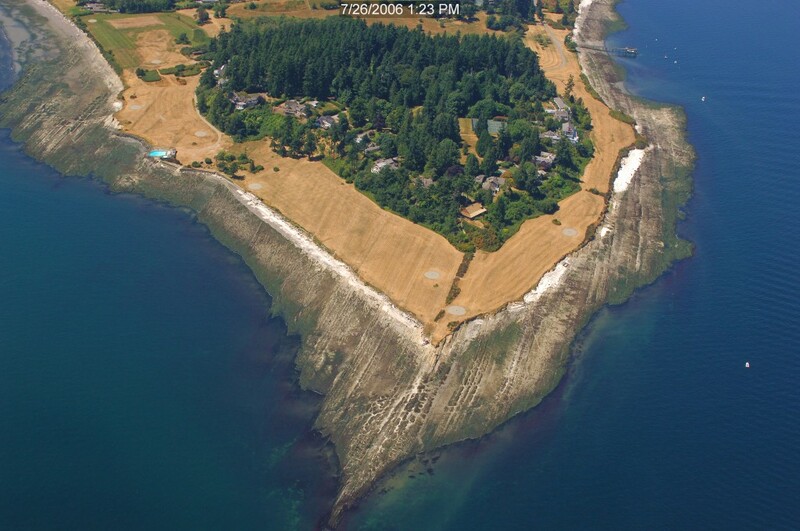 Evidence is still visible at the south end of Bainbridge Island, where a submerged beach is now high and dry. Restoration Point on Bainbridge Island was uplifted 20 feet by an earthquake on the Seattle fault. Most of us have heard concerns about the worrisome Cascadia subduction zone earthquake, which raised alarms after the New Yorker magazine described its potential effects. 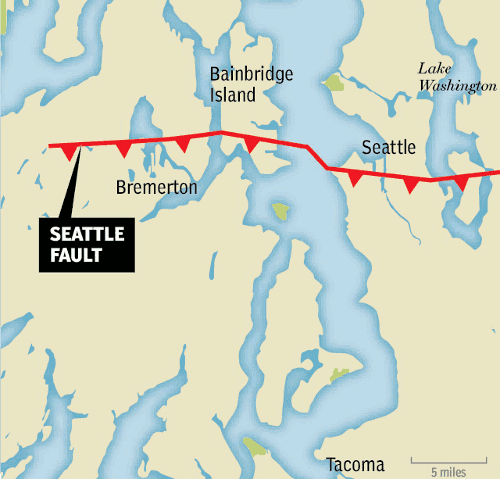 But for many residents of Puget Sound, a quake on the Seattle fault could be far worse, though probably less likely over the next 50 years. 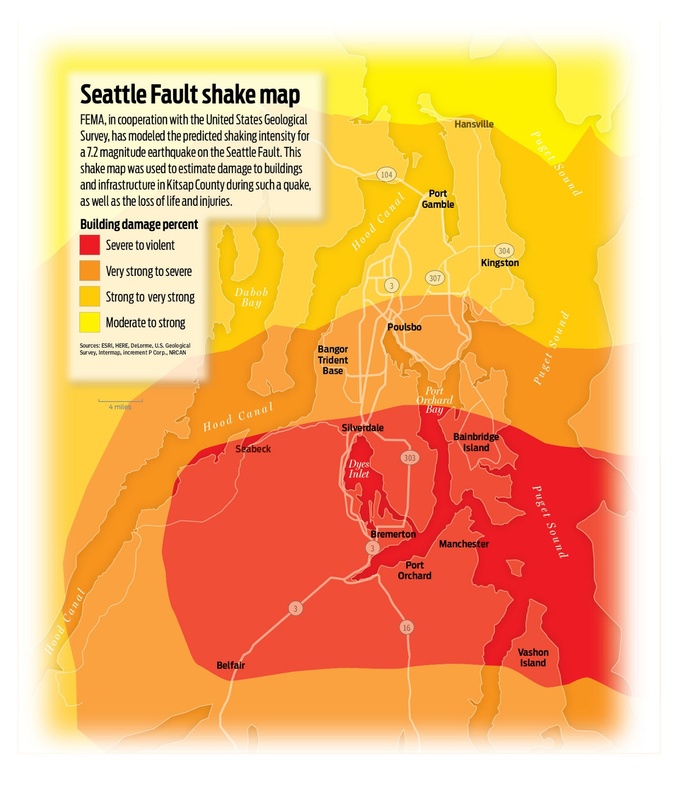 The Kitsap Sun stories were based upon an earthquake scenario developed by the Federal Emergency Management Agency and presented to local governments in a “Draft Risk Report.” A separate scenario for a 6.7-magnitude quake was developed in 2005 by Earthquake Engineering Research Institute, which modeled the effects of fault rupture from Seattle through Bellevue to the east. The death and destruction in either scenario is hard to imagine, and who wants to think about devastation in this seemingly peaceful part of the world? Keep in mind that even in a worst case, most people will survive to rebuild and go on with their lives, as they have in other parts of the world, including Japan. As we have learned from other areas, being prepared can make a real difference. When I think about getting prepared, I begin with water. We cannot live without it. The preparedness list published on the Kitsap Sun’s website includes developing an emergency plan for your family, addressing structural problems with your house, learning first aid and several other things. I was thrilled to hear about the attitudes of people in a Port Orchard neighborhood where families worked together to develop a neighborhood emergency plan. I learned a lot in the story by reporter Tristan Baurick. If you would like to help organize your neighborhood, Kitsap County Department of Emergency Management (PDF 373 kb) can help. Reporter Ed Friedrich wrote about the potential damage to Navy facilities, and reporter Tad Sooter wrote about how businesses are coping with the risks of an earthquake. I wrote about the geology that leads to these great risks we are facing in a story called “Multiple geologic forces make region vulnerable to quakes.” I also wrote about an early-warning system being developed to give people a brief notice of severe shaking, which could be enough time to save lives. In the matter of the early-warning system, President Obama’s proposed budget to Congress, released Tuesday, includes $8.2 million for the early-warning system. See the news release from Sen. Patty Murray and Rep. Derek Kilmer. A good explanation about how people might benefit from the early-warning system is provided by Richard Allen in a presentation Feb. 2 in Washington, D.C., called “The Resilience Summit.” This issue is discussed in a YouTube video from 7:40 to 14:00 minutes into the video. Another video, below, provides additional details about the design of the early-warning system and how it would function in the Los Angeles region. Called Shake Alert, the project has its own website. The Pacific Northwest Seismic Network is a key part of the project. All these years later, I still hear from folks who tell me that the book has given them a better understanding of natural systems. They say it has helped them realize why Hood Canal remains a special place to visit, to work and to live. I’m always pleased to hear from Hood Canal residents who tell me that this book retains a special place on their coffee tables or bookshelves. With the hope that “Splendor at Risk” still has relevance today and to offer it free to more people, we are making the original publication available to read online (Scribd) or to download one chapter at a time (PDF). Thinking back to the origins of the book, it all started with a notion by Mike Phillips, who had just become editor. He wanted to launch a big project to bring the staff together, so he solicited ideas on a broad range of topics. The idea to focus on Hood Canal came from Craig Darby, a reporter who had been pushing for a Hood Canal series even before Phillips arrived. Until then, I had been reluctant to endorse Craig’s idea. I believed a comprehensive look at the entire Hood Canal ecosystem was too ambitious for one or two reporters, which had been the limit of our collaboration at the time. But when I heard that a dozen news reporters would be involved, I became enthusiastic. In the end, management of the project was turned over to City Editor Jeff Brody and me. We came up with an outline for a series of articles every month for a year. We covered water resources, water quality, wetlands, fish, shellfish, forests and related jobs. We also covered human activities, such as places to visit, the Navy’s submarine base at Bangor and the rapid growth of housing development. The one topic that we failed to anticipate — since the problem was not well understood — was Hood Canal’s growing low-oxygen problem. Every news reporter on staff at the time played some role. I ended up writing about half the stories over the course of the year. I still remember how I escaped from the bustle of the city to spend time in remote areas. One part of my mind focused on the science, while another tried to capture the mood for each environmental story. Each monthly series began with a scene-setter noting the specific time of year. It’s as if the human heart yearns for a more primitive experience, away from the cluttered pattern of modern life, says Celia Parrot, caretaker of the property. “The reason I go out two or three times a day is not just to walk the dogs,” she said. “It’s like a refueling. I go out to get another dose of that intimate feeling…. The Sun’s designer/photographer at the time, Theresa Aubin, came up with a headline for that introductory piece. 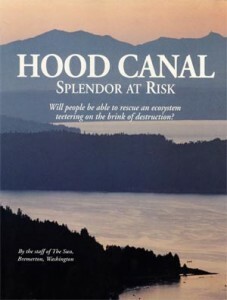 She called it “Hood Canal: Splendor at Risk.” The name stuck as the title for the entire series and the book. When the project was finished, we thought we were done. But there were calls for reprints, and we conceived the book project. 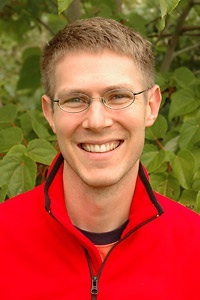 Jeff Brody reorganized the stories into logical chapters. We got help from the staff at Washington Sea Grant to design the pages and coordinate the publication. I undertook the tedium of creating a topical index. Some 6,000 copies were produced in two printings, sold mostly through advance orders. And then the book was out of print. Thanks go to Phil Best of the Hood Canal Environmental Council for his continued interest through the years and his willingness to scan the pages into digital format so that everyone can read this book online. We never submitted the book itself for any awards, but the Washington State Library System noticed it, and we were honored with a Governor’s Writing Award presented by Booth Gardner, governor at the time. On the five-year anniversary of the series, I returned to the broad subject of Hood Canal and updated some of the major topics, but the connections of place and time were missing. Regular readers know that I frequently delve into Hood Canal issues in some depth — but not across the landscape that “Splendor at Risk” represents. At the end of each monthly series, we offered a list of things that people could do to help Hood Canal. In the book, the list became a chapter unto itself, and it is interesting to read that now. Many of the suggestions call for people to learn, get involved in projects and demand action from their government. If I were to make such a list for Hood Canal and Puget Sound today, it would not be much different. At the time we wrote the series, a project of this scope was highly unusual for a newspaper our size. In the newspaper business today, with shrinking staffs, such a project seems even more remote. Hood Canal has changed me. Even though I’ve worked for The Sun for 14 years, I am not the same writer I was a year ago. Even though I’ve lived in the Northwest for 21 years, I am not the same person. It isn’t so much the beauty of Hood Canal that has me enchanted. At some point, it’s best to get beyond the pure splendor of the place. Call it an appreciation that the wildness of nature still exists, one small life linked to another, all struggling to survive, humans included. It looks like Kitsap County’s shorelines task force is off to a good start. All but a couple of the 20 members attended the first official meeting of the group last Thursday. Everyone seemed happy to be there. Several members made a point of thanking the county for bringing the task force together at the start of the process of updating the Kitsap County Shorelines Master Program. Kitsap County’s planning director, Larry Keeton, said he is not aware of another county relying on a citizen task force to the extent that Kitsap is. Check out the story I wrote for Saturday’s Kitsap Sun. One member said he was glad to be part of the process, even though he realizes that the plan finally adopted by the county commissioners may be different. As a “get-to-know-you” exercise, the meeting’s facilitator, Margaret Norton-Arnold, asked members to talk about themselves. And, to get a snapshot of their views, she asked them to place their names, a picture or some kind of symbol in an appropriate spot on a long poster. On the poster, a picture of industrial development had been drawn on the left side, with a forest scene on the right. People who believed that development had already left its mark were asked to place their symbol on the left, while those who favored restoring things to a pristine condition were asked to place their symbol on the right. Most people placed their names/pictures close to the center. Two or three tried to suggest ways of bringing the opposite sides together. Only Bob Benze of the Kitsap Alliance of Property Owners chose not to place himself on that spectrum. He said his emphasis during the planning process would be to make sure individual property rights are respected and that the laws be followed. Benze’s statement prompted Tom Nevins, a member of the Kitsap County Planning Commission and a longtime conservation supporter, to get up and say his focus would be on community values while respecting people’s rights and the underlying laws. His mark went somewhere in the middle. Frankly, that’s exactly what I expected from those two, which is one reason I predicted a lively debate in my April 18 Water Ways entry. As Norton-Arnold described it, the process of consensus-building will allow room for all viewpoints. Where compromise cannot be reached, she will prepare “majority” and “minority” reports to reflect the full range of opinion. While introducing herself, Norton-Arnold revealed her longtime relationship to Kitsap County, and I discovered a distant and roundabout connection between her and myself. Earlier this month, Garrison Keillor and his live variety show, The Prairie Home Companion, performed at the Paramount Theater in Seattle. He actually conducted two shows, the first on March 27, the second on April 3. 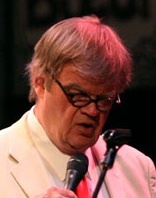 As Keillor generally does when he travels throughout the country, he visits with local people and fills the discussions with references to local places, events and folklore. “If dry socks and dry underwear are very important to you, this may be the wrong place for you to move to,” he quips during his second show. I bring this up to call attention to a segment in which Keillor calls to the stage Jeff Adams of Washington Sea Grant and author of the blog “Sea Life” on the Kitsap Sun website. You’ll find Jeff’s segment at 81:58 in the player at right. 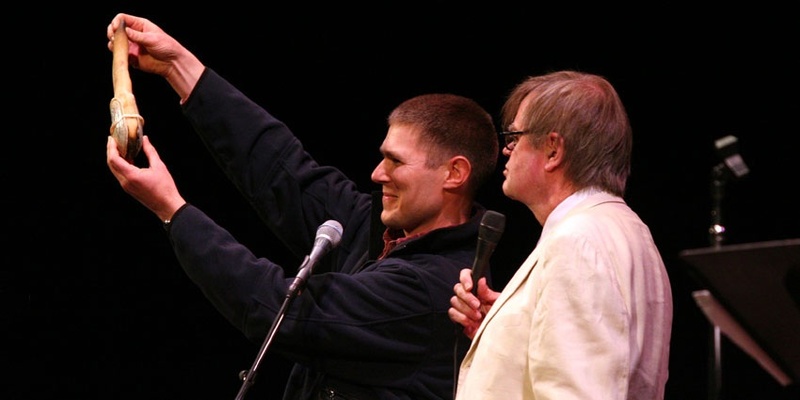 Keillor was impressed that Jeff was an opera singer, which is something I did not know. But that’s a story for another time, Keillor says. Adams was there to talk about our local sea life, and the naturalist begins by telling the prairie visitor about our whales. “We do, we do,” Jeff says, pulling out a live geoduck. Adams also talks about our giant Pacific octopus and tells Keillor that there are plenty of places to hike around here. But watching how the show was handled before he went on put Jeff somewhat at ease. I believe that Adams did an admirable job of demonstrating his passion and bringing a slice of our local water life to a national audience. Jeff Adams displays a geoduck clam for Garrison Keillor and the audience at Seattle's Paramount Theater.